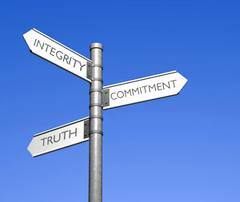 Many people today believe that morality and ethics are old-fashioned principles; that if morality and ethics ever were valid and necessary in man’s daily life, they certainly are not valid and necessary today. These same people are convinced that there are no fixed standards of right and wrong, good and evil. In spite of these commonly-held beliefs, I assure you that ll of us make moral and ethical choices every day, whether we understand or not, and whether we make those choices consciously or sub-consciously. Furthermore, I assure you that there are fixed standards of morality and ethics. Those standards are set by God, and are specifically stated in His Word. We find God’s standard of right and wrong, good and evil stated concisely in the Ten Commandments. Of course, liberals, even liberals who claim to be Christians, believe that the Old Testament is no longer relevant. They believe that the Old Testament God of judgment and punishment has been replaced by the New Testament God of love and forgiveness. This is an immature and shallow interpretation of God’s Word. God’s standard of right and wrong has never changed. Whatever was called SIN in the Old Testament is called SIN in the New Testament and it is still SIN today. The only thing that changed was the ways God dealt with SIN and SINNERS through different dispensations. Now, the people who say that no such standard exists (because they do not believe His Word) also state that circumstances dictate what is right and good for the situation. This position is adopted to “justify” choices and actions that could otherwise be challenged. This was the position of many in Nazi Germany and Fascist Italy. But understand fully the dangers in holding to and following this belief. It most often leads to an immoral, violent, depraved culture, or can lead to a tyrannical existence. God’s design for the perfect, complete life (the Kingdom) will be ruled by a rod of iron, the Word. Man needs (requires) a standard to govern him. When given absolute freedom of choice, man goes into anarchy. God has revealed to us that He says is good, what is right. Our freedom of choice is either to obey, or disobey. We are thus free to choose, but be aware that every choice has consequences. The responsibility is ours to either choose wisely or foolishly. If we choose wisely, blessing is the consequence. If we choose foolishly, the consequence is judgement.